Brandon Clarke scored 24 points and blocked three shots as No. 4 Gonzaga won by 48 points. The Zags might move up in the AP poll Monday, as No. 3 Virginia lost at home to No. 2 Duke on Saturday. SPOKANE — Brandon Clarke scored 24 points and blocked three shots as No. 4 Gonzaga routed Saint Mary’s 94-46 on Saturday night for its 14th consecutive victory. 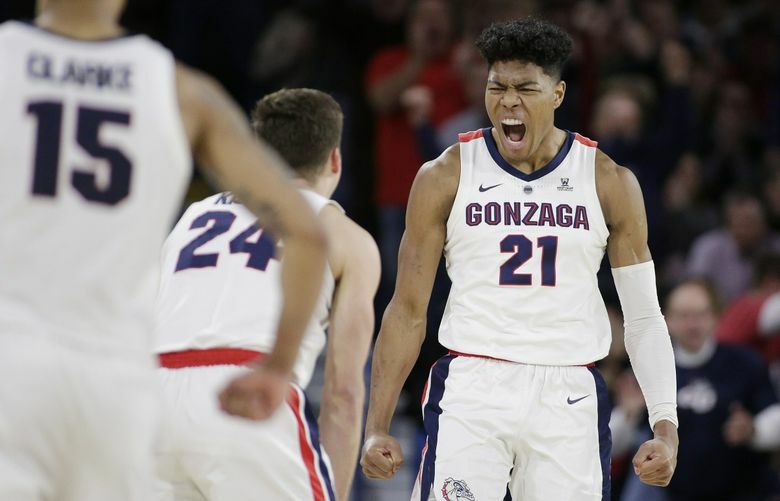 Rui Hachimura added 18 points and Filip Petrusev had 15 for Gonzaga (23-2 overall, 10-0 West Coast Conference), which is likely to move up in The Associated Press poll after No. 3 Virginia lost to No. 2 Duke earlier Saturday. The Gaels shot just 25.9 percent as Gonzaga’s defense prevented them from getting clean looks. The Zags shot 58 percent. Gonzaga was up 53-20 at halftime. Saint Mary’s was scoreless for the final 4:38 of the first half, missing 6 of 7 shots. The Gaels shot just 20 percent in the first half (6 of 30), while Gonzaga was shooting 60.7 percent from the field and making 14 of 16 free throws. Gonzaga forward Killian Tillie, who limped off the floor on Thursday and did not return, suffered a torn ligament in his right foot and is out indefinitely, the team said before the game.